During their many years of public speaking, one of the biggest challenges Tom and Dennis have encountered is the webinar format. There are a lot of moving parts and some unique challenges. In this episode of The Kennedy-Mighell Report, Dennis Kennedy and Tom Mighell discuss how webinars differ from in-person presentations, how to prepare for and avoid common pitfalls when presenting on webinars, and practical tips for novice and veteran presenters. Got the world turning as fast as it can? Hear how technology can help. Legally speaking with two of the top legal technology experts, authors and lawyers, Dennis Kennedy and Tom Mighell. Welcome to the Kennedy-Mighell Report, here on the legal talk network. Dennis Kennedy: Welcome to episode 127 of the Kennedy-Mighell Report. I’m Dennis Kennedy in Saint Louis. Tom Mighell: I’m Tom Mighell in Dallas. Dennis Kennedy: In our last episode we focused on some of our favorite presentation tips for panel presentations as a second part in our three part series on presentation tips. In this third and final part of the series, we’ll talk about the unique challenges of presenting in the webinar format. Tom, what’s on our agenda for this episode? Tom Mighell: Dennis, in this edition of the Kennedy-Mighell Report we’ll be talking about presentation tips when you’re giving a webinar and in our second segment we’ll talk about a new court decision in Europe on Google and the right to be forgotten that’s been getting a lot of interest recently. As usual, we’ll finish up with our parting shots, that one tip websider observation that you can start to use the second that this podcast is over. First let’s get started with our first segment and that is webinar presentations. I tend to find that I am giving a lot more webinar presentations these days. The technology is better, I don’t have to travel anywhere, the group that’s giving the webinar doesn’t have to spend money for me to travel to them. While you are spared that hassle of travel, I think webinars are far from uncomplicated and sometimes can present a whole lot more problems than live presentations. Dennis, I know many presenters who say that that lack of audience feedback is by far the biggest challenge when you’re presenting in a webinar format, not being able to see and interact with your audience I think really does affect the presentation. Should I assume you will not be taking a contrarian approach to that? Dennis Kennedy: No, I won’t but your comments about how much the savings are in travel expenses does make me wonder why we don’t get paid more to do webinars since there should be a little extra in the budget with those travel expenses saved. I do think the lack of audience feedback is just a huge thing and that’s especially true for speakers who really thrive on the audience energy, or really rely on audience response to get a feel for how their presentation is going over. It is a really tricky thing because you just don’t … there’s nobody out there, there’s no happy face, there’s no one nodding off, there’s not that friendly face who’s nodding their head to what you say. I think that can be really tricky and then also I think that energy of the audience that’s missing too is difficult and so you can find yourself in that … I know I’ve found myself in a webinar sort of wondering if there’s anybody out there and what they’re doing or if anybody’s even hearing what I’m saying. It is very unique in the feeling you get as a presenter. Tom Mighell: I think that the one reason why it kind of is I think a little bit creepy is that most of the webinars are muting their attendee line so that there isn’t talking. I know that if they don’t mute it then we’re going to hear them talking to other people in their office, we’re going to hear wait music if they put the phone on hold, because they always put the phone on hold and we’ll hear a lot of distortion if people are using cell phones and are having a bad connection. I get why they do it but all you hear is dead silence and I think it’s very unnerving, I think that if you’re presenting alone it’s actually a little bit worse than if you’re presenting with somebody, at least with somebody you can have a conversation and go back and forth. If it’s just you talking it’s kind of like talking out into the void and you have no idea whether people are hearing you or not. That’s the most challenging webinars that I have and that’s why I enjoy the ones that make use of good technology platforms that you can interact either with the attendees by chat or by question or at the very least, to interact with the moderator and other people that might be on the panel with you. Dennis Kennedy: Yeah, and I think that’s true that the ones that you’re doing solo are really tough because sometimes, I remember a couple times I just feel like I’m talking and I don’t know, I feel like I’m alone in the room and chattering away and it just gives you kind of an odd feeling. That aspect where it is so quiet that it’s tricky and it’s like you’re just talking on the phone. I mean it really is a sense, I guess that in some ways being on radio or podcasting even are similar but at least in our case there’s … we’re talking to each other. Even if you’re speaking yourself Tom, there’s a lot of factors that I think are different when you’re presenting in a room full of people. Tom Mighell: Yeah, I think it is different because you’re having to come back on that and say it can be different. It doesn’t have to be, it depends on the type of webinar that you’re giving. If you’re just giving a straight Power Point presentation you have no control over it and you’re just sitting in front of a monitor watching somebody move slides for you, then you’re just talking there on the phone and you can say whatever you want. There aren’t a ton more factors that you have to deal with. I’m starting to be involved a lot more with webinars where the technology platforms are more advanced. The speakers take more control over the presentation itself and with great control comes great responsibility. You’ve got to keep track of a whole lot of moving pieces and make sure that you’ve got to make sure that your phone is connected. They all talk about getting on a land line and I’m starting to see people not using land lines anymore. My land line here at home where I usually do webinars is it took for me, actually not as reliable as my cell phone. Sometimes I’ve actually gotten on Skype and done webinars there which I think would make most webinar presenters, the hosts freak out. You’ve got to worry about keeping that connection up, you’ve got to worry about whether you can see the screen, whether you can see it, what’s going on? You sometimes have the moderators trying to talk to you in a back channel chat or something like that. There’s a lot more demands on your attention which can make it a little bit more distracting, a little bit harder and more complicated and you’ve got to pay attention to a lot of moving pieces. Dennis Kennedy: It is different when you’re talking on the phone. Like you said, there is a big emphasis on using land lines when you’re on webinars and you lose the visual cues to know exactly when a co-presenter is stopping and ready to throw things to you and that can make it tricky, especially when you’re not used to working with people. Depending on who’s producing the webinar, there can be a ton of different structures, instructions and different platforms you’re using and I think you’re right, you do feel sometimes that there’s this dashboard with instant messages coming at you, questions coming from the audience, the slides moving and then you’re trying to keep track of what’s going on. Also, webinars tend to be, they want you to be really tight on time. It just seems like there can be a lot going on and then if you’re sitting at your desk … same as presenting live, I’ve just had … it’s unbelievable all the things that will happen to you of some technical problem happening while somebody is calling you on your cell phone and a whole bunch of other things going on and you’re trying to smoothly present a webinar. Tom Mighell: I think that the hardest thing really is to get a handle on the technology that you have to use. I think frankly, using a Power Point is probably the easiest way of presenting a webinar but for me, there are times and frankly, most of my webinars these days are about presenting on the iPad. It’s very difficult to give a presentation on the iPad on a webinar because you have to present the iPad screen on to your computer monitor for people to be able to see it. If you’ve got a technology platform if the webinar doesn’t have the ability to share your screen, if you’re only limited to looking at the screen of the webinar provider, whoever is providing and hosting the webinar, then you got a problem. If I want to show an app or if I wanted to show a Word document or a spreadsheet or if I wanted to show something from my computer I’m really liking these days the platforms that allow you to take control and show things rather than have to rely on the webinar provider’s platform. I know that there are some platforms that we’ve had real challenges with. I know that one that the technology has such an issue that we have to actually record a screen cast in advance so they can show that rather than actually have us do any kind of demonstration live. I think those are the things you have to work through ahead of time. I think you have to understand what’s the platform? How are we going to use it? That’s why I think that having a rehearsal with the platform and with the technology and with your co-presenters and with the moderator and the people who handle the phones and all those people, having a rehearsal ahead of time, a couple of days ahead of time, is really, really important because you want to make sure that you’re all in sync and that helps in case you have to … if something goes wrong, you at least have had that experience in working through what the platform looks like. Dennis Kennedy: Yes, I really like working with the people at ALI because they do that say usually there’s a lot of communication ahead of time. Sometime within a week before or a couple days before the actual presentation there’s … you do a walkthrough of the technology and that way you can identify problems because sometimes I tend to be the one who has some of these problems. It could be that one person can’t move the slides forward or have trouble seeing things or it’s not working in their browser or their computer, there will be some other issue and you get that identified ahead of time, then usually the other presenter can drive the slides as we say or do these other things and you can have a sense of what will work and what won’t and what back up you might want to have in place. I think that, you know again, it would be nice to do a total walk through of things but you lose, to me, I don’t like doing that because you lose the energy or you have the potential to lose the energy in the actual presentation. Knowing how to move the slides forward, practicing with how the questions will appear, how you can instant message the other presentation the host and getting a script in hand ahead of time, I think are all great things. When you get those things when you’re doing a webinar you really appreciate how professional, I mean the difference between a really professional webinar and one that’s been thrown together. Tom Mighell: When you say scripting, let’s make sure that we’re talking about the same thing because when I think of scripting and I agree that it’s important to have a structure. The best webinar providers will send you a shell that will have all of the predetermined language at the beginning and the end of the webinar to get you into the webinar. Once you’re in I really I think I really have an issue with scripting, I’m just not a fan of it. I’m a fan of having an outline so that you know what you’re going to talk about but for me, having a script for an online webinar is the equivalent to a person reading their slides out while they’re sitting there in an in person presentation. It just sounds stiff, it doesn’t sound natural to me. I’ve had a lot of experience reading some scripts and I think that I can read a script, I’ve done it for the podcast occasionally where I’ve read lines that I wrote down ahead of time while I was prepared. I like to think that I sound natural but I think most people don’t practice enough for that. I think that having that outline with your talking points and being comfortable with the subject, is really important. I have had webinars where I wasn’t comfortable with the subject, where I didn’t know it as well as I wanted to and I did actually script it out and those were probably my least favorite webinars because I just felt so wooden while I was giving the presentation, I just didn’t feel like I was being very natural there. Dennis Kennedy: I agree with you, I think it’s that introduction, the conclusion, knowing where the moderator is speaking, what the phone operator is reading instructions. It is funny that sometimes when you’re introducing somebody you know and you don’t think you need to write out what their bio is; you can really stumble all over yourself. Some of those things at the start, I think it’s really helpful to have that written out in front of you. Once I’m in the presentation I just want to have a clear idea of … most co-presenters it’s we have the slides and we have an initial on them to know who’s taking what slide and then have an option within that to say if there’s something you want to add you can jump in. The script, in a funny sense is just more that kind of guideline. Speaking of slides, Tom, I think there’s also a big difference in the types of slides that you want to do in a webinar versus live. It’s sort of tricky at the same time and this goes back to what you were saying of showing what’s on your iPad or doing live demos are the same sort of thing. I think because you picture your audience typically maybe listening on a speaker phone in their office, doing other things, having lunch while they’re doing the presentation. There’s I think a tendency to put more information on the screen than you might do if you’re presenting live. That can get a little tricky because sometimes you’re not used to it. I’m not used to putting that level of information on a slide so that can make it harder to prepare. You’re trying to think of what people might be looking at. Then also in those in the webinar platform, sometimes the slides will show you the current slide and the upcoming slide and sometimes the slides that you actually see on your screen, you as the presenter are a lot smaller than full screen and if you have a really complex slide with small font or even a screen shot that you’re going to talk about, sometimes it can be hard to see or hard to read in a presentation to know exactly what’s there. Tom Mighell: That’s why I think it’s important to do a print out of your presentation so you’ve got your slides in front of you or I don’t give a webinar without … my usual set up is two monitors and I’ll throw the presentation up and follow along with the slides on the other monitor if I have the chance to do that. I think I disagree with you a little bit on the format of the presentation in terms of how I view creating a slide deck or a Power Point presentation for that. I really don’t consider my webinar audience any different. I suppose that it’s true that if you’re going to expect that people are not going to pay as much attention while they’re on the phone, then you want to include more on the slide so they can take away more after the webinar and I suppose that makes some sense. I tend to give materials anyway and I don’t necessarily rely on my Power Point to do that. I guess I give the presentation that I want to give whether it’s got a lot of text or not and I really don’t pay a whole of attention to that. How do you like to handle a question and answer? Even though we don’t get to interact a lot with the attendees, there is question and answers at various times during the presentation or at the end when they open up the phone lines or whatever it is for questions. Is there a way that you like to handle it or what experiences have you had? Dennis Kennedy: Again, it depends on the platform a little bit but it seems like most of the platforms these days allow people to submit questions during the presentation. That can be really great because if you see questions where you’ve used some acronym or you’ve done something that you assume everybody knows and you get a question about that you can correct that quickly. Somebody doesn’t understand something or asks a question, you can incorporate it right into what your presentation is so you can almost answer the question right away or make it part of the presentation that gives you some feedback. The questions at the end, I really, I tend to like when they just come in almost like you’re being texted or emailed the questions rather than to do the talk show, take a caller thing because you don’t know exactly what to expect there. When you have those written questions you can take them in the order that you want and then emphasis some points and then both or all three presenters can see those questions and you can figure out who to respond to. I really like the Q&A format on webinars. Tom Mighell: Yes, I don’t mind having questions come from out of left field, that kind of makes it interesting and mixes it up a little bit. I will say that the way I usually like to handle questions is to say just like you said that if a question comes in that is directly on point for something we’re talking about to correct something or explain something or how much is that app that you just mention cost? What was the name of it? Something like that, I think it makes a lot of sense to handle those questions in time. I will invariably, we get questions that are out of left field that have nothing to do with the topic that I’m talking about and I prefer to handle those at the end and say, “Let’s just talk about all those at the very end.” While you’re right, it’s nice to have those there so you can think about what you want to answer; I also like the extemporaneous nature of it and talking off the cuff when you’re dealing with it. We’re about to run out of time for this particular segment, why don’t we talk a little bit about our best suggestions. What are some tips that you have for people who are going to be presenting webinars who maybe don’t do it a whole lot? Dennis Kennedy: Two things that I want to point out. One, when you’re talking with other people and you just think about it on the webinars that you listen to, that it can be really difficult to tell who’s who when you’re speaking. Dennis Kennedy: I think when you transition from one speaker to another that if you use somebody’s name; if I say, “Tom, you have the next slide.” Even something as simple as that, then over the course of the webinar I think that helps the listener understand who’s who and that’s I think a radio technique. The other thing is that you really need to give a lot of thought to controlling your environment that really means avoiding interruptions and extraneous sounds from turning off your cell phone to warning other, if you’re doing it from your house, warning the other people in your house that you’re recording and for them not to make noise. Doing everything you can and you might turn off fans and all that sort of thing. Give some thought to that and there are some things you can’t control, the sirens and stuff like that. One of my favorite things ever was I was finishing up a webinar and I saw these guys in hard hats walk outside my house while I was speaking and I finished the webinar and two minutes after I was done they started, it was the cable company and they were trimming limbs around the cable line in the back yard so there was all this chain sawing noise that would have been going on during the webinar if they would have come a few minutes earlier. Tom Mighell: My biggest challenge here is that I have three dogs. Working out of the house, I have three dogs who will begin to bark at the slightest provocation to defend the house against any and all intruders and or other dogs. It is one of my checklist items before I do a webinar is to bring then downstairs and give them some treats and then lock them out of the room so that they can’t get anywhere near and hopefully don’t make any noise while it’s happening. My two biggest tips are first, prepare with your co-presenter. We talked about panel discussions in the past and we talked about presenting with other people that you may not know. I think that you can get away with no preparing with your co-presenter better in person because you’re setting there right next to them and you can look at each other or whisper or pass notes or doing things that can make up for your lack of preparation that you do not get those opportunities when you’re giving a webinar with somebody. If it’s somebody you’ve never presented with before, take the time to have a conference call with them and say, “Here’s how I like to do this and here’s how we’ll do the slides.” Reach some level of agreement about how things will happen; I think it’ll make for a much better webinar. This wouldn’t be a legal technology podcast if the tip wasn’t something along the lines of understanding the technology that’s being used to do the webinar. Unless you’re just logging into a browser and you’re watching your Power Point being advanced by someone else far away and you’re just talking on a phone, it really pays to understand the technology, to know what it is that’s being used and how to make use of it yourself so that you can make the webinar as successful as you can from your end. Dennis Kennedy: Before we move on to our let’s segment, let’s take a quick break for a message from our sponsor. Looking for a process server you can trust. Servenow.com is a nation-wide network of local pre-screen process servers. Serve Now works with the most professional process servers in the industry, connecting your firm with process servers who embrace technology, have experience with high volume serves and understand the litigation process and rules of properly effectuating service. Find a pre-screen process server today. Visit www.servenow.com. We’re glad you’re listening to Legal Talk Network. Check us out on Facebook, Twitter and LinkedIn, too. Tom Mighell: Let’s get back to the Kennedy-Mighell Report, I’m Tom Mighell. Dennis Kennedy: I’m Dennis Kennedy. There’s a recent ruling in Spain about something called the right to be forgotten and the requirement Google might or might not have to stop displaying negative information on its search results pages. The facts are sort of unique but the decision raises a number of important issues people have been talking about for a long time and it’s certainly created a lot of discussion in the last few days. Tom, you really wanted to talk about this topic, so why don’t you give us a little background on it and give us your take on the issues. Tom Mighell: Yeah, I did want to talk about this because I really think that it signals some potentially big issues for search engines coming down the road. Again, if it means what we think it means and if courts are going to enforce this against search engines, I think it could potentially be huge although maybe not here in the United States. This is a case that’s actually in front of the Europe Court of Justice, biggest court in the European Union and it involves a man from Spain, his house was repossessed I think 16 years ago and it was posted on a website. Google, of course has a link to this page, it’s indexing all the pages on the Internet so Google Spain has a link to the page that shows it’s repossessed. The man claimed that because the matter was closed it should no longer be linked to Google so that whenever somebody searches for his name they don’t see that 16 years ago his house was repossessed. The court actually declined to hold the website itself responsible for having that information up there, but they found that Google had bigger responsibilities saying that Europeans in general have a right to be forgotten, which frankly is not surprising to me given the fact that Europeans place a much higher priority on privacy on personal information. It’s already actually having huge effects because the decision came down I think on Tuesday or Wednesday and already Google is receiving many, many, many requests from Europeans requesting that information be I guess delinked in the search engines. Google right now is trying to figure out what’s the right balance; is the balance between right to be forgotten and the right to know and then who’s the arbiter of that, who has to make that decision? Is Google going to make the decision? If it does, it’s going to add another layer of complexity to Google’s work. Do they have to verify the person is who they say it is? Do they have the power to judge the merit of the request? What happens if they just refuse? Obviously if they refuse then the person can take them to court and there would have to be a whole adjudication on that. I don’t think it’s going to catch on in the United States. Here the First Amendment would really be an obstacle to that because I think we’ve seen people make demands to take information down about information that’s defamatory or in violation of copyright and the courts are very good about that but when it comes to facts being on the Internet I think there would be a huge push back both from the technology companies that we’re seeing and from folks who actually like the First Amendment. What I really think is interesting here is that these claims are going to Google. It’s not going to the original web page that’s posting the information, which to me shows that people believe that if you can’t find it on Google it doesn’t exist. Maybe that’s a simplistic way of putting it but I think very well might be true and I think it has the potential to change the way that we’re going to think about search engines in the future. If the search engines continue to follow the requests of these people who want to be forgotten, can we trust them to give us an unvarnished view of information? Are we really know that we’re getting the full picture? Is that kind of the sense that you’re getting out of this too, Dennis? Dennis Kennedy: Yeah, and I think it illustrates a couple of things that we’ve seen over the years. One is the so-called Streisand Effect. We may not know anything about this guy and he wants us to, he wants to have this right to be forgotten but we do know that he had this issue 16 years ago so now there’s more attention than there ever would have been just because it shows up in a Google search I guess on his name, which we would have never done except now we know about the case and everybody’s going to be talking about the case so people are going to be looking for it. It’s kind of this sort of reverse effect that typically goes by the Streisand Effect. When you don’t want attention paid to you and by talking about it on the Internet you get more attention. I think it also touches on the really interesting issue of when there are facts in the public record that in the old days used to be really cumbersome to find, you had to go to the courthouse you might have to look on microfilm. Now they’re easy to find and they’re easier to aggregate, does that aggregation of each part of the information which is public is it an aggregation of it somehow? It definitely feels like an invasion of our privacy but how does that really work and how do you think through that. You said the focus on Google is interesting too, because is it the same issue with the other search engines or other web properties, news organizations that link to that and isn’t the web itself all about hyper linking? It also feels like another one of those cases where judges, the courts, regulators don’t have a good sense of what hyper linking is and how essential it is to the Internet. Finally, I think what you touched on is that confidence that you have in Google or another search engine giving you what seems to be objective results. I think our confidence has been diminished because of the way the SEO works that people can game search results. Now if we know that Google has to be involved in taking things down and not showing certain things then does our confidence in the objectivity and the completeness of search results, is that going to be impacted negatively and it feels like it might be. Tom Mighell: I think that what makes this really unworkable is that the European Court is now really inserting an entire level of administration into this whole process that I think they’re expecting the search engines, Google, Yahoo, whoever to undertake. Certainly Google’s got the money, they could do it if they wanted to, they could establish a department of the right to be forgotten where they handled all those requests. They get lots of take down requests every day, lots and lots and lots of take down requests for You Tube they’re getting every day for copyright violations. Now the question is it’s easier to see a copyright violation than it is to see other things. What if I just submitted something and said I had a different name and I actually said I was somebody different from who I was and I had things that were removed from the Internet that somebody didn’t want removed? I just really think there’s a lot of risks here that the court again, probably because they weren’t really thinking, they’re thinking more in terms of protecting the person and their privacy than what the implications of this in the long term could be. Dennis Kennedy: Yep. Now it’s time for our parting shots that one tip website or observation that you can use the second this podcast ends. Tom, take it away. Tom Mighell: We’ve done a three part series now on presentations so I figure that for those of you who are using PCs and who do use Power Point, I could not recommend more Paul Unger’s book, “Power Point in One Hour for Lawyers” the one hour book’s from the ABA really are terrific because they’re not huge massive reference materials that you’re going to have to spend hours going through. It’s a book that’s about 150 to 200 pages, it’s got very succinct information on how to use Power Point to tell a story, to persuade juries to use it in the right circumstances and not use it in the wrong circumstances. Paul does a really good job making Power Point explainable and understandable so if you’re going to give a presentation with Power Point and you still don’t feel comfortable enough with it because I know a lot of people who aren’t; get a copy of Paul’s book. Dennis Kennedy: As people know I like to recommend podcasts that really make you think and I’m a big fan of Clayton Christensen who’s known for the “Innovator’s Dilemma” and when you hear about disruption and disruptive technologies, that’s his concept. September 2013 he did a presentation, there’s audio available it’s on some of his new thinking called “The Capitalist’s Dilemma” which I think takes innovation to a broader level and is really interesting in terms of how it describes what happens in economies over time and how innovation plays a part. I think it has implications for lawyers too, definitely worth an hour of your time to listen to this. It comes from the RSA which is the Royal Society for the Encouragements of Arts, Manufacturers and Commerce in the UK and we’ll have a link in our show notes but I think from that description you should be able to find it. Like I said a good use of an hour of your time. Tom Mighell: That wraps it up for this edition of the Kennedy-Mighell Report. Thanks for joining us on the podcast. Information on how to get in touch with us as well as links to all the topics we discussed today is available on our show notes blog. @tkmreport.com. If you like what you hear please subscribe to our podcast in iTunes or on the Legal Talk network site. You can get to the archives of all of our previous podcasts in both places as well. If you have a question you want answered or an idea for an upcoming episode please email us at [email protected] or send us a tweet. I’m @tommighell and Dennis is @denniskennedy. Until the next podcast, I am Tom Mighell. 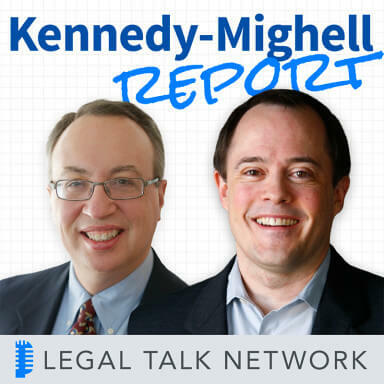 Dennis Kennedy: I’m Dennis Kennedy and you’ve been listening to the Kennedy-Mighell Report a podcast on Legal Technology with an Internet focus. Help us out by rating this podcast or writing a review on iTunes. Thanks for listening to the Kennedy-Mighell Report. Check out Dennis and Tom’s book, “The Lawyer’s Guide to Collaboration Tools and Technologies, Smart Ways to Work Together” from ABA Books or Amazon. Join us every other week for another edition of the Kennedy Mighell Report only on the Legal Talk Network.